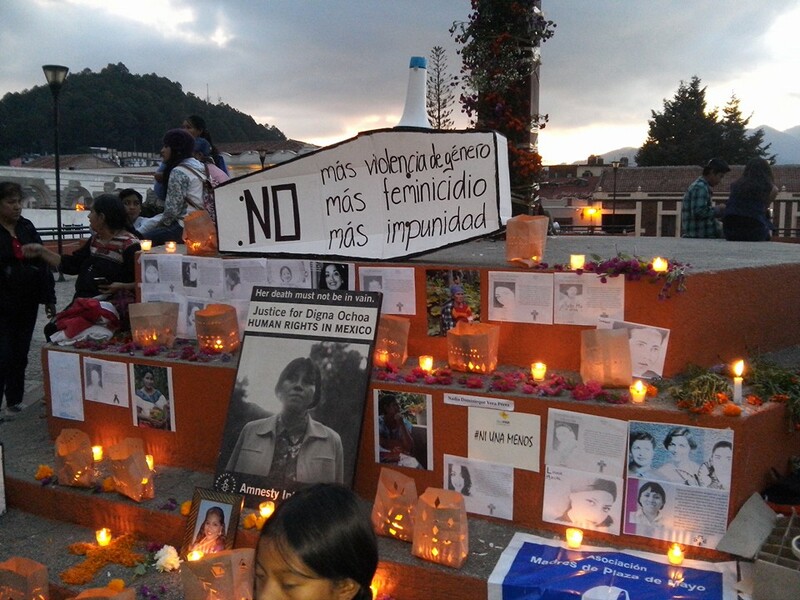 On 25 November, the International Day for the Elimination of Violence against Women, several events were held in San Cristóbal de Las Casas, Chiapas. For one, the Movement of Women in Defense of the Land and Territory and for the Right of Women to Decide held its first assembly on 23-24 November. 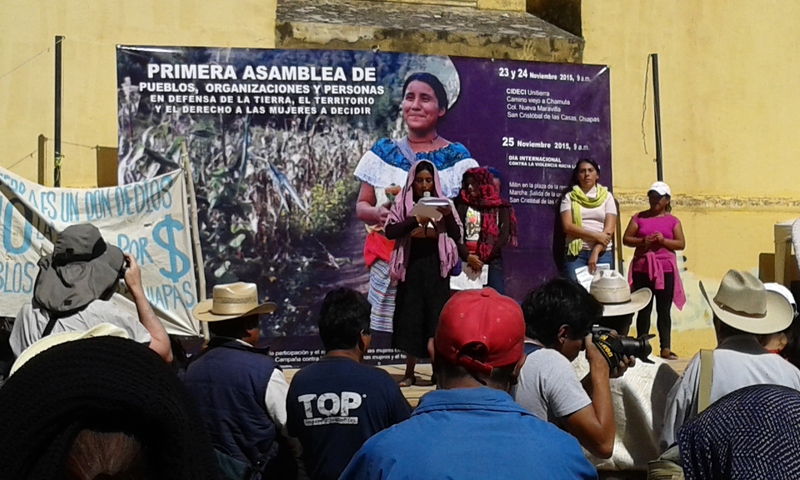 Through this action, the organization released a communique “in favor of social property, in opposition to all forms of privatization of the land and territory” and denouncing “the energy reform as well as its continuation in the strategic rural reform.” The women, together with some men, ended the meeting with a march against violence against women. 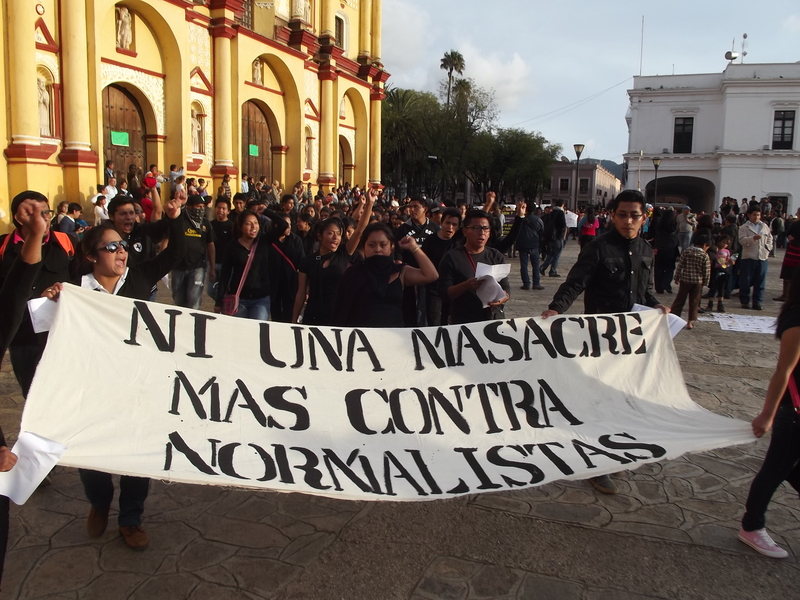 Beyond this, the Movement in Defense of Land and Life (MODEVITE), from the Believing People of the San Cristóbal de Las Casas diocese, also marched on the same day. 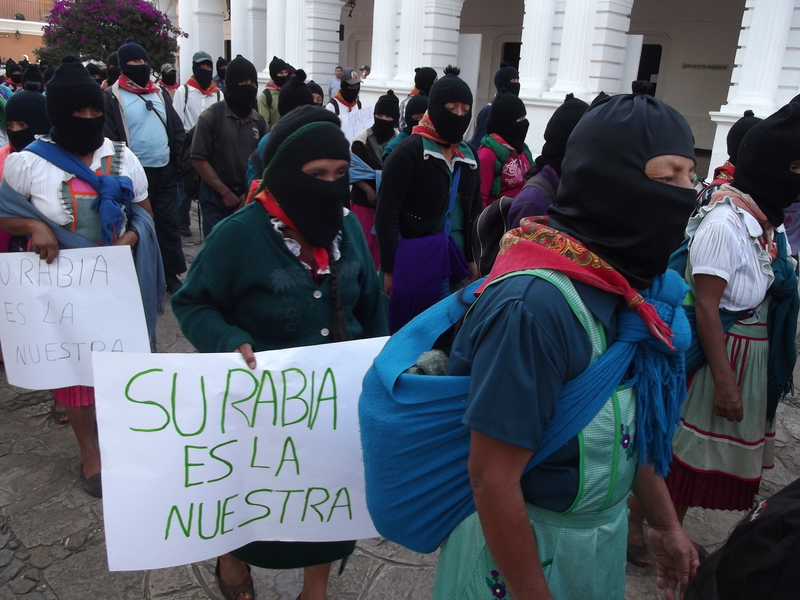 Simultaneously, thousands of persons (30,000 according to Proceso) mobilized in ten other municipalities in the state, “to remember that Mother Earth must be protected against the mining, oil-extraction, and hydroelectric-dam megaprojects, among others, that are being imposed on our lands […]. We will raise our voices to prevent the sale of alcoholic beverages, drugs, and prostitution in our communities, and we will denounce the ineptitude and corruption of authorities in terms of failing to resolve these problems.” Both marches converged and reached Central Park jointly. 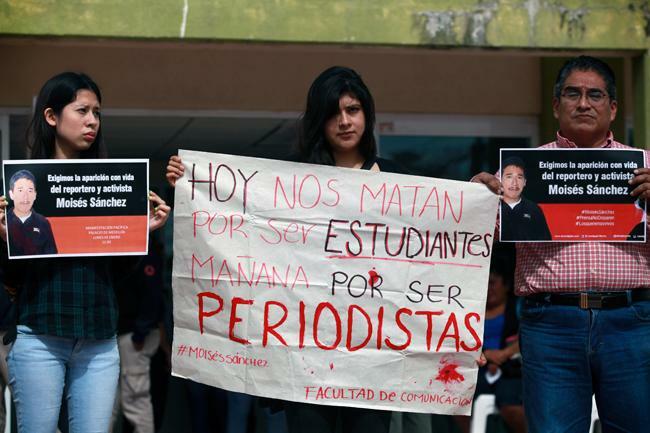 Despite the fact that the two groups had already announced their events, in the Cathedral Plaza, where the marches traditionally end to give way to rallies, the space was occupied by the state-government. From early in the morning, privatized space was installed for the event at which Governor Manuel Velasco Coello awarded support “From Heart to Heart” to 4,000 single mothers. It bears noting that initiatives like the Movement of Women in Defense of the Land and Territory and for the Right of Women to Decide have denounced the welfarism promoted by the state governments, which lead to dependency and end up becoming a form of social control over women. Since 25 April, the attacks have been on the rise. This is the case, according to the organizations, as seen in the “possible acts or omissions, ignorance, corruption, or irresponsibility on the part of the authorities and public officials, both municipal and State, in both the judicial and executive branches.” For this reason, they have demanded that the human rights of the residents of FSTSE2001 be ensured, that the perpetrators of attacks be arrested, that existing arrest-orders be cancelled, and that a work-table be installed to implement immediate actions to avert the destruction of the wetland, beyond initiating an exhaustive and professional investigation into the probable conflict of interest with the Díaz Ochoa family, especially Mariano Díaz Ochoa, the ex-mayor of San Cristóbal, former sub-delegate for governance in the highland, and now a candidate for the mayorship of San Cristóbal for the third time.